When I ran in 2010 I was the only candidate in this Ward, and one of the few in the city, to stand up against Rob Ford publicly. His pathetic and dangerous personal behaviour aside, it was his agenda I most opposed. 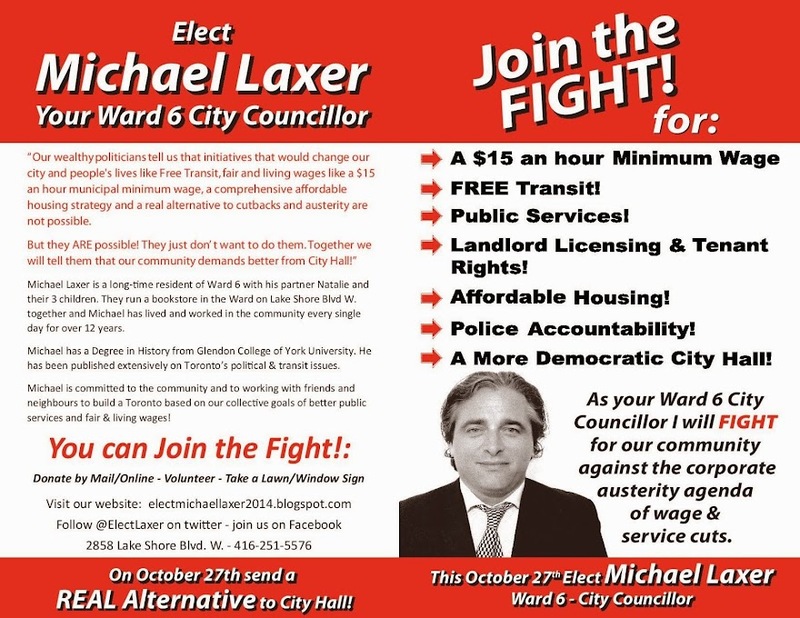 Together we need to fight this agenda, an agenda that goes beyond Rob Ford and that is the Capitalist agenda of service and wage cuts. A fundamental part of the right wing austerity agenda is to make public services private. Eventually they would like to see all government privatised and run for the profit of corporations and Bay St. instead of for the needs of the community. They want to drive down wages and make the people pay for what should be free services. If elected to council I will fight not only against the further privatization of any public services, including garbage collection, but also to put back into public hands all services that have been privatized. We need a real and forceful Socialist alternative to this agenda. A Socialist alternative built around people and not profit, built around community and not the rich. Read my response to the Toronto Taxpayers Coalition about the austerity agenda: We are Torontonians NOT Taxpayers!